Manipal, Oct 17, 2017: Students of Hospitality and Tourism Management, Department of Allied Hospitality Studies, Welcomgroup Graduate School of Hotel Administration (WGSHA) conducted activities that send a message of hope. They made hundreds of diyas (traditional lamp) using organic and sustainable environment friendly material like clay and wheat flour for the festival of lights. These diyas will be used for Diwali celebrations at the WGSHA hostels. Artists, Surendran, Srinath and Ravi, guided the student to make the eco-friendly diyas at a workshop here at the college. 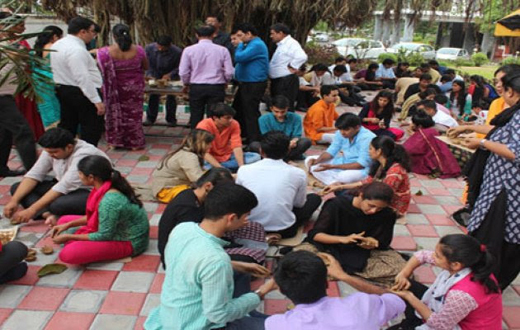 The Student Empowerment for Environmental Development (SEED) constituted under the Centre for Hospitality and Tourism Research (CHTR),WGSHA, Manipal University conducted the programme to inculcate sustainable approach in products and processes. Prof.Parvadhavardhini Gopalakrishnan, Principal, WGSHA, Manipal University demonstrated the preparation of clay diyas to the students. Prof P Valsaraj, Coordinator,CHTR and DAHS briefed the students on the importance of eco-friendly and sustainable practices in Diwali celebrations. “Sustainable practices are the responsibility of the youth. It has become increasingly important to focus on creating awareness and leaving a positive impact on the society through such workshops. That is the focus of SEEDalways,” said a student.